After the frustrations of Wednesday’s disrupted qualifying session for the 75th Le Mans 24 Hours, RML’s MG Lola EX264 was back on form for a treacherously wet second day at the Circuit de la Sarthe. 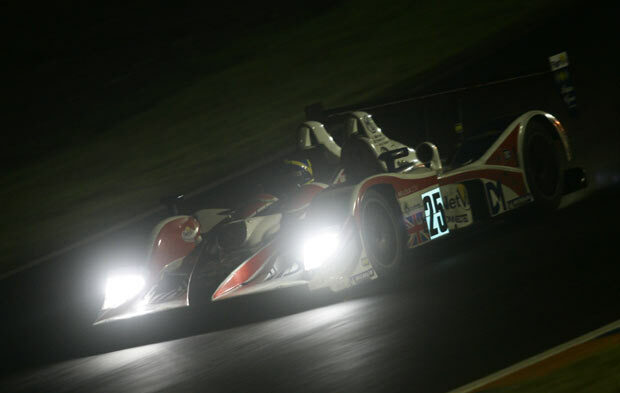 Torrential rain and standing water for almost the entire four hours ensured that there was no possibility of improving on the sixth-fastest time in LMP2 set by Andy Wallace on Wednesday. However, running third quickest in Thursday’s atrocious conditions, and under the kind of watery downpour that the forecasters are predicting for the race, was more in line with expectations for the RML MG. What was especially significant is that Mike Newton’s individual best time was also good enough for fifth-fastest, confirming the overall strength of the RML driver line-up. With Wednesday’s technical issues resolved, it was a far more comfortable Andy Wallace that was first out onto the circuit at the start of the daylight session, completing his required three-lap stint without incident, despite monsoon-like conditions. Mike Newton then enjoyed the remainder of the first period, posting a time of 4:31.102 to stand third-quickest in LMP2, behind the two front-row Zyteks. After the break, and with some minor adjustments to the car’s aerodynamics, Thomas Erdos was given free-rein to establish the best possible wet set-up for the EX264. A series of exploratory laps, interrupted by brief visits to the pitlane for adjustments, resulted in a best lap from the Brazilian of 4:17.297. It sliced nine seconds off his previous benchmark, and while a little short of the times set by the two Zyteks (4:11.296 and 4:14.508) was a significant seven seconds ahead of the next quickest in the class. All three drivers are now looking forward to the race with confidence. “The conditions were challenging tonight,” admitted Andy Wallace, “but with the work we’ve done now, we’ve achieved an excellent balance for the race.” Thomas Erdos would have liked the opportunity to go quicker. “I set my quickest time on a preparatory lap,” he said. “If I’d pushed, I think we’d have been with the Zyteks tonight.” Mike Newton was especially pleased to have set third quickest for his own stint. “That was the highlight for me, and makes up for being below the technical qualifying time.” It is believed that more than 30 other drivers are also outside the required time. The team is now looking forward to a day of final preparation, and a dry warm-up, if at all possible. A high resolution gallery is now posted.